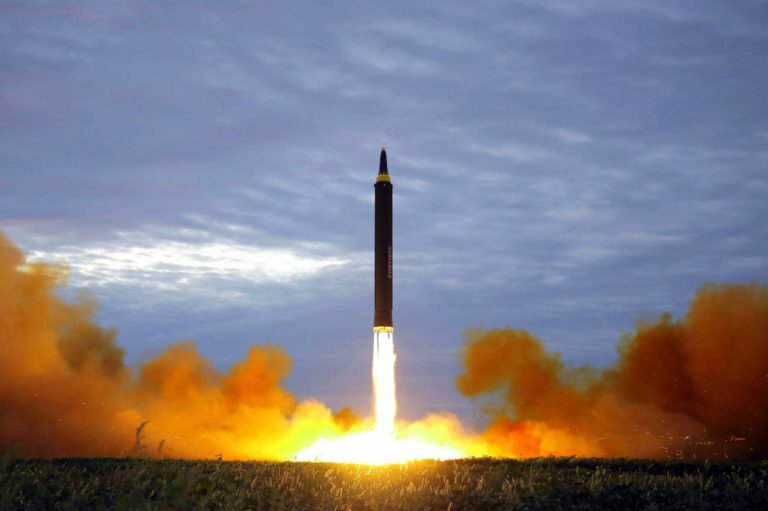 NUCLEAR DREAMS: This photo, distributed last August by the North Korean government, shows what was said to be the test launch of a Hwasong-12 intermediate range missile. Korean Central News Agency. A group of Chinese geologists believe the mountain above North Korea’s nuclear subterranean test site has collapsed under the stress of test explosions. Such a scenario could explain why Kim Jong Un has announced that his country is prepared to end its testing programmes. Seismic data was collected by scientists from the University of Science and Technology of China following a 100-kiloton test in September, which is believed to have triggered four earthquakes. The region is not one where earthquakes naturally occur and no quakes were detected after the five smaller tests North Korea has conducted since 2006. The research paper said the first of the earthquakes occurred just minutes after the explosion and was “an onsite collapse toward the test centre”. Those that followed were an “earthquake swarm” in similar locations. North Korea’s nuclear tests are of special concern to Beijing, since the test site is less than 60 miles from its border. North Korean nuclear tests have caused seismic events in Chinese border towns and cities and raised fears of wind-born radiation. This has stoked growing distrust among some Chinese against their country’s long-term but unpredictable ally. Kim made a visit to Beijing last month after China’s implementation of UN economic sanctions reduced trade between them by as much as 90 per cent. Kune Yull Suh, a professor of nuclear engineering at Seoul National University, warned last year that further tests could threaten to cause a volcanic eruption at Mount Paektu, which sits on the border with China. On Saturday, North Korea announced it would close its testing facility and suspend nuclear and intercontinental ballistic missile tests. The move came as Kim prepares to sit down and meet with President Trump.